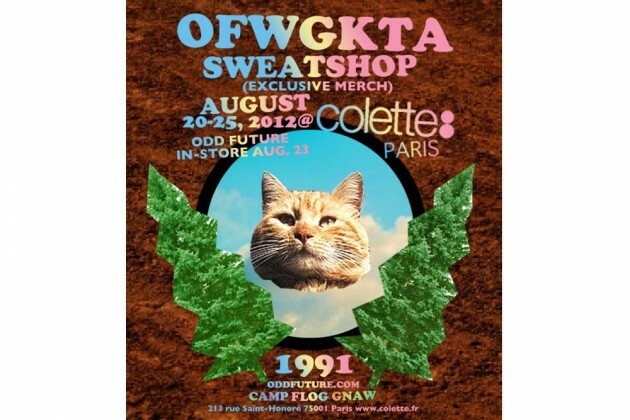 From August 20th to 25th, colette in Paris will be hosting an Odd Future pop-up store. On August 23rd the entire OFWGKTA crew, Odd Future and Frank Ocean, will also be passing by the shop. For the special occasion, the sponsor of the event, German premium beer brand Warsteiner, has created the limited edition ‘OFWGKTA’ beer bottles. Inspired by the current Odd Future album cover, the bottle comes with an Odd Future donut graphic all over design in their signature colors. Odd Future was so excited about the collaboration, that they even decided to bring the beer to their US tour dates later on. Where? Inside colette Store 213 rue Saint Honoré 75001 Paris, When? Thursday: August 23, 2012. Time: as of 3pm. As usual, you first saw this new OFWGKTA information, here on HipsterTribe.